Würzburg Residence and Reichsburg Cochem are good opportunities to explore the local culture. Marienburg Fortress and Heidelberg Castle (Schloss Heidelberg) will appeal to history buffs. 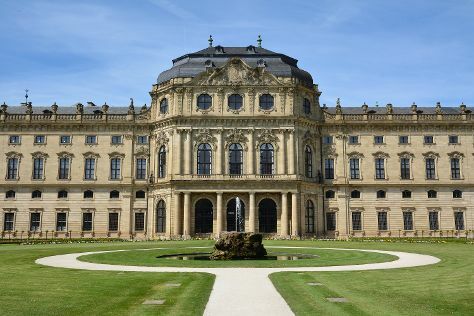 Explore the numerous day-trip ideas around Frankfurt: Altstadt (Old Town) (in Heidelberg), Alte Mainbruecke (in Wurzburg) and Marksburg Castle (in Braubach). And it doesn't end there: explore the world behind art at Staedel Museum, admire the landmark architecture of Cathedral of St. Bartholomew (Dom St. Bartholomaus), and don't miss a visit to Main Tower. To find reviews, photos, more things to do, and more tourist information, go to the Frankfurt trip itinerary planning site . Sao Paulo, Brazil to Frankfurt is an approximately 15.5-hour flight. You can also do a combination of bus and flight. You'll lose 4 hours traveling from Sao Paulo to Frankfurt due to the time zone difference. Traveling from Sao Paulo in May, things will get a bit cooler in Frankfurt: highs are around 22°C and lows about 11°C. Cap off your sightseeing on the 31st (Fri) early enough to travel to Berlin. Kick off your visit on the 1st (Sat): don't miss a visit to East Side Gallery, then steep yourself in history at Mauermuseum - Museum Haus am Checkpoint Charlie, then make a trip to Potsdamer Platz, and finally admire the masterpieces at Pergamonmuseum. On the next day, step into the grandiose world of Charlottenburg Palace, then ponder the world of politics at Reichstag Building, and then steep yourself in history at Memorial of the Berlin Wall. For other places to visit, photos, traveler tips, and more tourist information, read our Berlin online holiday builder . Getting from Frankfurt to Berlin by flight takes about 3 hours. Other options: take a train; or drive. Finish your sightseeing early on the 3rd (Mon) to allow enough time to drive to Prague. Deepen your sense of the past at sights like St. Vitus Cathedral and The Powder Tower. Prague Castle and Mala strana are good opportunities to explore the local culture. There's lots more to do: don't miss a visit to Old Town Square, explore the galleries of Convent of St Agnes of Bohemia, contemplate in the serene atmosphere at Kostel sv. Mikuláše, and take some stellar pictures from Vyšehrad National Cultural Monument. To find more things to do, other places to visit, reviews, and other tourist information, you can read our Prague vacation maker website . Getting from Berlin to Prague by car takes about 3.5 hours. Other options: fly; or take a train. In June, plan for daily highs up to 26°C, and evening lows to 15°C. Finish your sightseeing early on the 7th (Fri) so you can take a bus to Karlovy Vary. Bohemia's historical spa town, Karlovy Vary serves as one of Europe's most glamorous vacation resorts. On the 8th (Sat), soothe aching muscles at some of the top local wellness centers, then take in the architecture and atmosphere at Pravoslavny Kostel Svateho Petra a Pavla, then see the interesting displays at Moser Glass Museum, and finally step into the grandiose world of Castle Loket. To see traveler tips, more things to do, other places to visit, and more tourist information, refer to the Karlovy Vary road trip planner . You can take a bus from Prague to Karlovy Vary in 2 hours. Other options are to drive; or take a train. Expect little chillier evenings in Karlovy Vary when traveling from Prague in June, with lows around 10°C. Wrap up your sightseeing on the 9th (Sun) early enough to travel to Vienna. Belvedere Palace and Karlskirche will appeal to history buffs. St. Stephen's Cathedral and Imperial Palace (Hofburg) are good opportunities to explore the local culture. There's lots more to do: take in nature's colorful creations at Schonbrunn Palace, get to know the fascinating history of Schonbrunner Gardens, take a stroll through Historic Center of Vienna, and learn more about the world around you at Natural History Museum (Naturhistorisches Museum). Plan a Vienna trip in moments using our itinerary builder. Traveling by combination of bus and flight from Karlovy Vary to Vienna takes 5 hours. Alternatively, you can drive; or take a bus. Prepare for a bit warmer weather when traveling from Karlovy Vary in June: high temperatures in Vienna hover around 29°C and lows are around 15°C. Wrap up your sightseeing on the 13th (Thu) to allow time to drive to Bratislava. Kick off your visit on the 13th (Thu): step into the grandiose world of Bratislava Castle and then take in the spiritual surroundings of St Elizabeth's / Blue Church. For ratings, reviews, where to stay, and more tourist information, you can read our Bratislava visit planning website . Traveling by car from Vienna to Bratislava takes an hour. Alternatively, you can take a bus; or take a train. Expect a daytime high around 30°C in June, and nighttime lows around 17°C. Wrap up your sightseeing on the 14th (Fri) early enough to drive to Budapest. Popular historic sites such as Matthias Church and Dohány Street Synagogue are in your itinerary. Get some cultural insight at St. Stephen's Basilica (Szent Istvan Bazilika) and Hősök tere. The adventure continues: contemplate the long history of Fisherman's Bastion, take in the views from Szechenyi Chain Bridge, admire the masterpieces at Hungarian National Gallery (Magyar Nemzeti Galeria), and admire the striking features of Parliament. To see where to stay, more things to do, ratings, and more tourist information, go to the Budapest trip itinerary builder tool . You can drive from Bratislava to Budapest in 2 hours. Alternatively, you can take a train; or take a bus. Expect a daytime high around 30°C in June, and nighttime lows around 15°C. Cap off your sightseeing on the 18th (Tue) early enough to go by car to Trieste. Trieste is a charming old town with a quiet atmosphere often compared to eastern European cities. Kick off your visit on the 19th (Wed): take a stroll through Citta Vecchia (Old City), then see the interesting displays at Civico Museo della Risiera di San Sabba, then contemplate the long history of Castello di Miramare - Museo Storico, and finally kick back and relax at Beach Barcola. To see other places to visit, traveler tips, photos, and other tourist information, use the Trieste trip itinerary site . Getting from Budapest to Trieste by car takes about 5.5 hours. Other options: do a combination of train, flight, and shuttle; or do a combination of flight and shuttle. Traveling from Budapest in June, you can expect nighttime temperatures to be somewhat warmer in Trieste, with lows of 21°C. Finish your sightseeing early on the 20th (Thu) so you can drive to Venice. Get a sense of the local culture at Basilica di San Marco and St Mark's Campanile. Get some historical perspective at Doge's Palace and Scrovegni Chapel. Explore Venice's surroundings by going to Padua (Basilica di Sant’Antonio & Scoletta del Santo). The adventure continues: don't miss a visit to St. Mark's Square, admire the masterpieces at Museo Correr, take in the views from Ponte di Rialto, and explore the activities along Canal Grande. To find maps, traveler tips, reviews, and other tourist information, read Venice road trip planning site . You can drive from Trieste to Venice in 2 hours. Alternatively, you can take a shuttle; or take a bus. In June, daily temperatures in Venice can reach 32°C, while at night they dip to 20°C. You will have some time to spend on the 24th (Mon) before leaving for home.